The Kapoors have taken over London and they are making the city look so good. Sonam and Anand Ahuja, who were already in London, were joined by her parents Anil and Sunita Kapoor, sister Rhea and her rumoured boyfriend Karan Boolani and brother Harshvardhan earlier this week. Diwali too was special for the family as it was Sonam and Anand's first after their wedding in May. 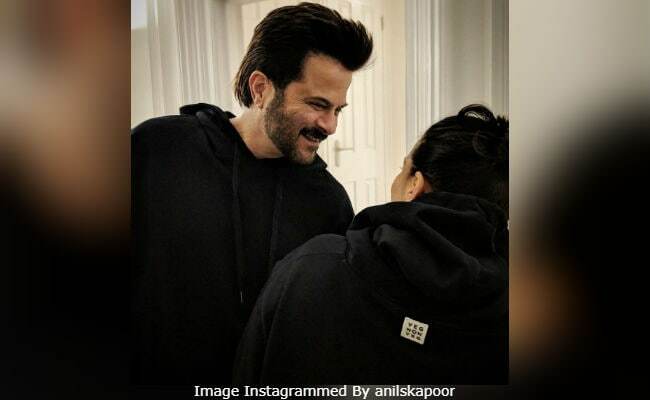 A few hours ago, Anil Kapoor lit up Instagram by sharing a wonderful picture with his wife Sunita, twinning in black hoodies. Ms Kapoor wore a hoodie from VegNonVeg, a brand owned by their son-in-law Anand Ahuja. "The camera shy wife of mine Sunita Kapoor posing for Anand Ahuja's brand. Both of us wearing black," he captioned the post. Sonam also shared some fabulous pictures on her Instagram timeline strolling happily on the streets of London. They also celebrating Harshvardhan Kapoor's 28th birthday in London. "Happy birthday to the stubborn, patient minefield of talent in our family. Harshvardhan Kapoor, I hope you get your happiness always and just the way you want it," Rhea wrote. And, this is how Sonam and Anand's first Diwali celebrations looked like. Here are the other pictures from the Kapoors' London diaries. On the work front, Sonam will resume shooting for the work-in-progress films The Zoya Factor and Ek Ladki Ko Dekha Toh Aisa Laga, which also features her father Anil Kapoor. Apart from Ek Ladki Ko Dekha Toh Aisa Laga, Anil Kapoor has also signed up for Total Dhamaal and he will play his son Harshvardhan's onscreen father in the biopic on Abhinav Bindra. He has Takht in the line-up too.